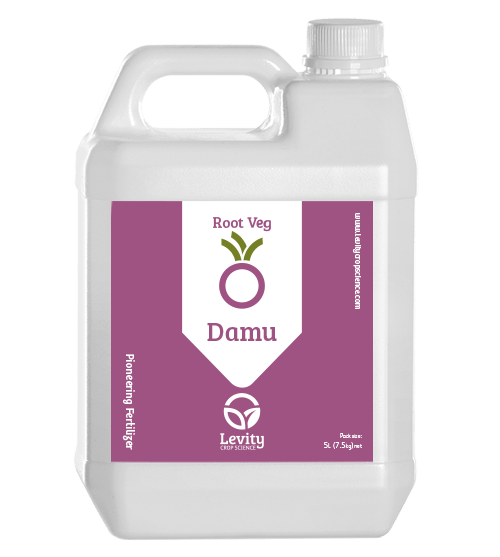 Damu for Root Vegetable bulking is designed to increase the size, and uniformity of carrots, turnips, parsnips, celeriac and other crops ahead of harvest, it can also increase sugar levels in sugar beet. Damu works by encouraging movement of photosynthates in the leaves down into storage organs, pushing resource into the root and bulking them. This approach both safeguards size and quality of root crops ahead of harvest. Direction of photosynthate flow is the strongest influence on grading late season. If growing conditions favour shoot growth more undersized roots occur, and yield reduces. Shoots can pull nutrients from storage tissure (roots and tubers), reducing quality and storage life. Damu focuses the plant on pushing resource into storage tissue (roots and tubers) to lift both size and quality. Application Rate: 5 l/ha two weeks before harvest to bulk roots. 2 l/ha throughout season whenever crop is experiencing fast foliar growth spurts.